When Luca was in preschool, we were asked to bring dairy-free and nut-free snacks in order to keep his classmates safe. We found a way to make a cute, colorful, somewhat healthy snack that all of his classmates could enjoy. Did you know that you could pop popcorn in the microwave using just a plain brown paper bag? *Be sure to read the ingredients of any processed foods carefully. Some candy corns and shredded cereals might contain dairy or nuts. Using the sack-lunch size brown bags, put about a couple of tablespoons of popcorn inside, fold the top over several times, place in your microwave and cook using the popcorn setting. Stay near the microwave and take the bag out once the popping stops. This method involves no oil and no chemicals so you can feel a little better about including sweets, such as candy corns. (I found red ones at Target last year). 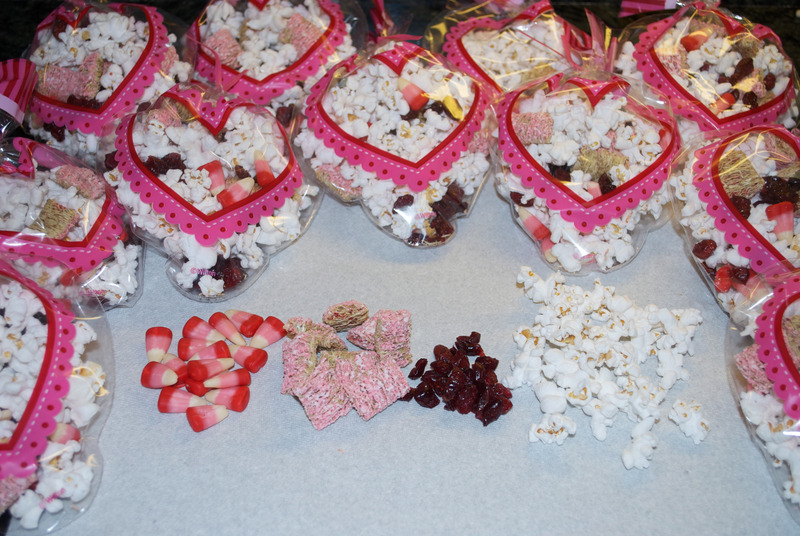 Portion out ingredients into small helpings of popcorn, Craisins, Strawberry Frosted Mini-Wheats and candy corn and place them inside valentine gift bags. (I found some cute transparent bags at Ben Franklin so the ingredients could show though). 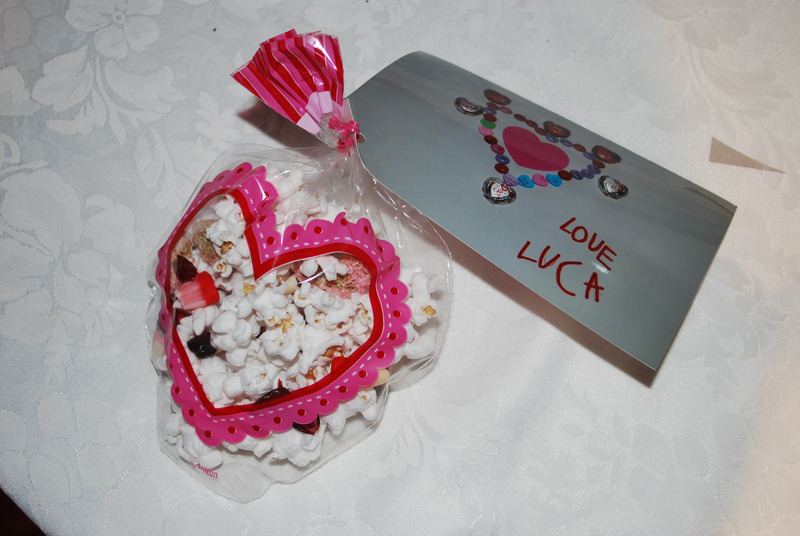 We added Luca’s Candy Valentine and sent the wrapped goodies in on Valentine’s Day. This entry was posted on January 25, 2013 by mdaucello in Holidays and tagged Holidays, Valentine.